An alternative perspective to that provided by the OTP in the IJT can be found in the Kenyatta Defence’s recent publication ‘The Prosecution of Uhuru Kenyatta at the International Criminal Court’ (‘Kenyatta Report’). Contrary to the argument provided by Mr Stover of the OTP and the author of the IJT article, the Kenyatta Report explains that the Kenyatta Defence and the Prosecution worked together, instructing a joint expert on mobile telephone communications in order to obtain cell site data. Once discovered and analysed, the mobile telephone evidence demonstrated that key OTP witnesses had lied about their presence at alleged events central to the Prosecution’s case against President Kenyatta. It is interesting to note, however, that when the Defence team attended the offices of the OTP to hand over a detailed analysis of the results of the telephone evidence, their submissions were dismissed summarily. It was as if the OTP did not want to know the results of the scientific evidence they had jointly commissioned. That is the most worrying aspect of the Kenyatta case. The case theory of the OTP was more important to it than evidence. That approach was apparent from the conduct of the case throughout, where the warning signs of a totally flawed case were signalled by the Defence right from the start of the proceedings. The culture of disregarding exculpatory evidence and the pursuit of a suspect regardless of the facts is an institutional failing that must be remedied as much as the employment of enhanced techniques of investigation. ‘Cell site data obtained in 2013 by the single joint expert for the Prosecution and the Defence for mobile telephone communications (“SJE”), Mr Paul Vella, established that key individuals did not participate in post-election violence planning meetings as alleged by the Prosecution. The cell site data came into the possession and control of the Prosecution and Defence through extraction processes operated by Mr Vella in mid-to-late 2013 and upon analysis revealed a version of events that to any impartial, objective and professional observer, wholly contradicted key allegations at the very heart of the Prosecution’s case. In July 2013, the SJE visited Airtel and Safaricom, both Kenyan mobile phone service providers to extract the cell site data of telephone numbers associated with key individuals central to the Prosecution’s case against President Kenyatta. Between August and October 2013, the SJE provided both parties with the extracted data. By way of cell site analysis, the Kenyatta Report goes on to dismantle allegations central to the Prosecution’s case against President Kenyatta (see paragraphs 69-80). However, the conduct of the Prosecution until the final withdrawal of charges was to in fact ignore the scientific evidence that undermined the case theory. That is why the overall culture of the institution must be reformed. 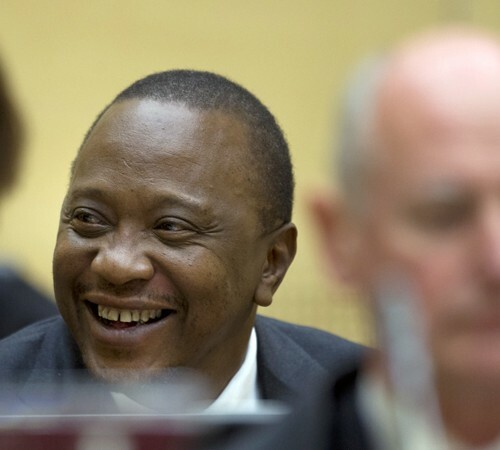 As far as the OTP’s arguments on the non-disclosure of financial records are concerned, it is also of note that on 18 June 2014, President Kenyatta consented to the full disclosure of his financial records pertaining to the relevant three-month post-election violence period of December 2007 to February 2008, as required by the evidence of the Prosecution case. None of these records in fact provided any evidence in support of the Prosecution case. The Defence advised the Chamber of this fact at a Status Conference held on 9 July 2014. See paragraph 14 of the 10 September 2014 ‘Defence Response to ‘Prosecution notice regarding the provisional trial date’ and Request to Terminate the Case against Mr Kenyatta’ (ICC-01/09-02/11-945-Red). The extension of time outside the period of the indictment was done to annoy, exasperate and cause the end of voluntary Defence disclosure, as it in fact did (ask for more and you will eventually be met with a rejection). The Defence decided that they had disclosed enough and would continue to be met with further OTP requests – “enough is enough”, as I said to the Trial Chamber when I advised them that the Defence had decided there would be no more voluntary disclosure. By this stage, the whole process had lost all semblance of legitimacy. This could be seen by the request for President Kenyatta’s attendance at the last status conference, for no reason at all. The conclusion reached by the Defence was that this was to see if he failed to attend (in exasperation or even defiance), in which case a warrant could be issued in a bid to “trouser” a victory from inevitable defeat. The Kenyatta Report concludes by stating that the ‘proceedings at the ICC against Uhuru Kenyatta represented a miscarriage of justice. Rights to ensure fairness by the Prosecution towards an accused that would have been expected in any jurisdiction were plainly not employed in his case. The failure to check credibility of witnesses, willful blindness to obvious fabrication of stories by witnesses in the pursuit of a case, represented an unreasonable campaign to prosecute an individual at all costs.